Marvel over one of Chile’s natural wonders and take a peek at a traditional desert town on this 7-hour tour from San Pedro de Atacama, including hotel pick-up. 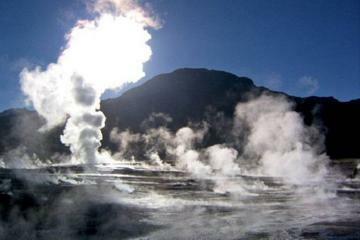 Make an early start and head straight to the El Tatio Geyser, then stand in awe before the hissing geysers, bubbling mud pools and steaming fumaroles as the sun comes up. After tucking into breakfast (included), journey to the sleepy village of Machuca to admire the mud-brick houses and browse the handicrafts stalls. Centrally located San Pedro de Atacama hotels. If your hotel is outside the hotel pickup zone, a central meeting point will be advised upon booking. Our tour guide was great!! One of the best we've had. It is freezing, so wear a lot of layers. Geysers are absolutely beautiful and set in a crater between mountains, but don't expect a large show of activity similar to Yellowstone in the US. Mostly just steam from them. Hot springs are more like luke warm, so not ideal if you visit in the winter. Try the llama at Machuca it's delicious! The place is great. Strongly recommend go visiting the place. The local operator was not the best. Is a very cold place and the breakfast was on the cold side. There were other local operators better prepared.